In honor of its 50th anniversary on Wednesday, Taco Bell held a private party, raised a new, retro-style flag above its headquarters, and prayed for the success of its biggest product launch of all time: a taco with a shell made entirely of nacho cheese Doritos. But the day of celebration and nostalgia was tarnished by some disturbing news. An employee at a Taco Bell in Palmetto, Fla., reportedly flew into a wild rage over the weekend, destroying the kitchen and assaulting a co-worker, after his manager told him to start doing his job. Eighteen-year-old Josh Fisher was assigned to take drive-thru orders last Saturday night, but the line apparently was pretty backed up. "Josh wasn't doing what he should of been doing," said his co-worker Cory Pearson in a witness affidavit, reported by The Smoking Gun. The manager, whose name is given only as Justin, apparently told Fisher to start taking orders, but he didn't respond. The manager then walked around Fisher, according to the affidavit, and started taking them himself. The report goes on to say that the manager asked Fisher to move, which apparently provoked him into a whirlwind of rage. Fisher began screaming, according to Pearson, and "told Justin if he got any closer he would snap his neck." Fisher allegedly began throwing food, equipment, utensils, and a headset, and caused "the sauce holder and the sauce container to hit another employee." As Fisher was leaving the store, he threw a box of pizza, which struck a female co-worker, Elizabeth McDonald, in the face, according to police. He returned moments later, "threatening everybody in the store, telling us he would kill everybody," claimed Pearson. According to police, the kitchen had to be closed for nearly an hour to clean up. Fisher was soon arrested, and put on a $750 bond for battery and a $500 bond for criminal mischief, reports the Bradenton Herald. Police say the teenager wasn't under the influence of alcohol or drugs. 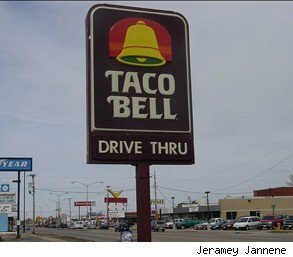 In Taco Bell's five decades of serving fast food, it's faced far bigger public relations problems, from an E. coli outbreak to challenges about the content of its seasoned beef.